Halakist and liturgical poet; flourished at Rome in the first half of the eleventh century. Of his halakic decisions only a few fragments are extant. 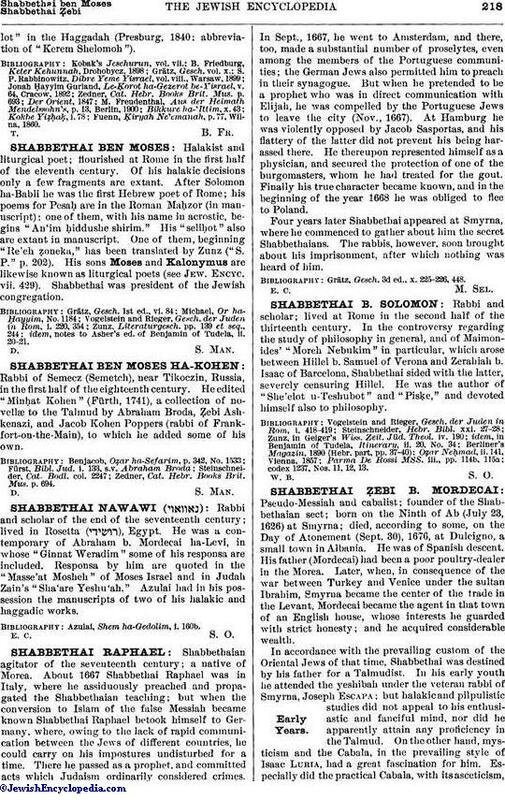 After Solomon ha-Babli he was the first Hebrew poet of Rome; his poems for Pesaḥ are in the Roman Maḥzor (in manuscript); one of them, with his name in acrostic, begins "An'im ḥiddushe shirim." His "seliḥot" also are extant in manuscript. One of them, beginning "Re'eh ẓoneka," has been translated by Zunz ("S. P." p. 202). His sons Moses and Kalonymus are likewise known as liturgical poets (see Jew. Encyc. vii. 429). Shabbethai was president of the Jewish congregation. idem, notes to Asher's ed. of Benjamin of Tudela, ii. 20-21.